When rhubarb season peaks in late spring/early summer, this is always a crowd pleasing dessert that we turn to. It packs a nicely balanced sweet and sour bite that is rounded out by the almond extract at the end. This cake stays nicely moist for up to three days after baking, and makes for a tasty breakfast as well! If you find yourself with a bounty of fresh rhubarb in the summertime, freeze the amount required by the recipe and bake year-round! Make the crumb first and place in the fridge while you prep the rest of the recipe, this helps the crumb maintain its integrity versus becoming a soggy mush on top of the cake. Our oven runs hot, so this bakes much closer to 35-45 minutes. It also depends on if the rhubarb is fresh or frozen. Baking with a piece of parchment paper on the bottom of baking dish helps the cake to pop out after cooling. If using a glass baking dish, the bottom of the cake should be lightly browned when it’s done. Sometimes the toothpick test doesn’t work well due to the goo of the rhubarb. 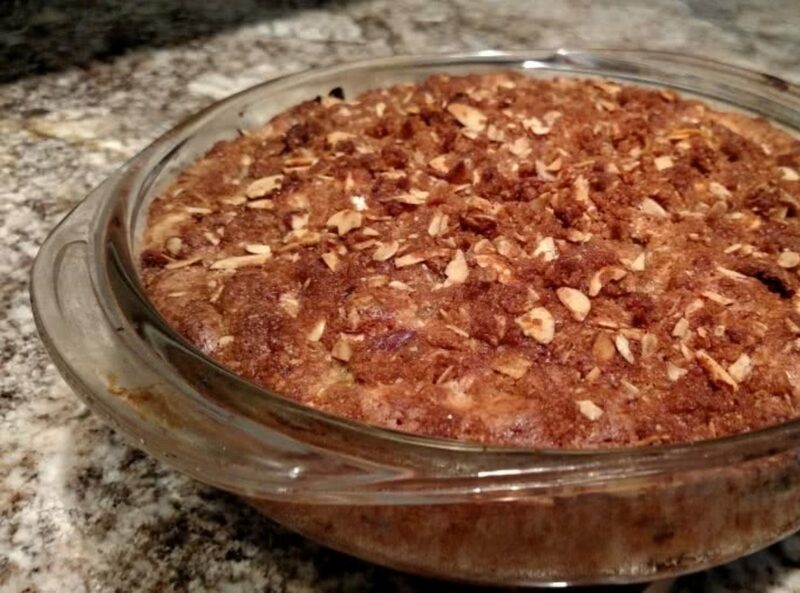 If your almonds are pre-salted, cut the salt in the crumble to 1/4 tsp.